Question 1: In match play, Matt tees his ball in front of the tee markers and slices his tee shot into trees on the right of the fairway. a) Has Matt incurred a penalty? b) May Matt opt to take his tee shot again from within the teeing ground? c) Must his opponent require him to play again from within the teeing ground, without penalty? d) May his opponent ignore the fact that he played from outside the teeing ground? a) No, because it is match play, Matt has not incurred any penalty. b) No, Matt does not have any choice; it is his opponent who may require that he plays his stroke again. c) No, Matt's opponent may require that he plays again from within the teeing ground. d) Yes, Matt's opponent may also ignore the fact that he played from outside the teeing ground and let the stroke stand. In match play if a player, when starting a hole, plays a ball from outside the teeing ground, there is no penalty, but the opponent may immediately require the player to cancel the stroke and play a ball from within the teeing ground, Rule 11-4a. 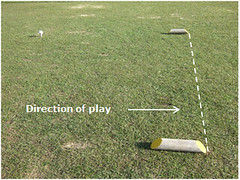 In stroke play a competitor is penalised two strokes for playing from outside the teeing ground and must then play a ball from within the teeing ground. If the competitor makes a stroke from the next teeing ground without first correcting his mistake or, in the case of the last hole of the round, leaves the putting green without first declaring his intention to correct his mistake, he is disqualified, Rule 11-4b. 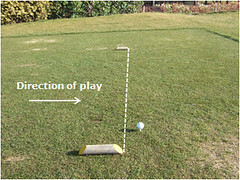 a) How far behind the tee markers may a player tee their ball? b) May a player stand outside of the teeing ground to play a ball within it? c) May a player repair any irregularity in the teeing ground before making their stroke? a) Up to two club-lengths from the front of the teeing ground defined by the limits of the two tee-markers, Definition of Teeing Ground. c) Yes, players are permitted to create or eliminate irregularities of surface within the teeing ground, Rule 13-2.